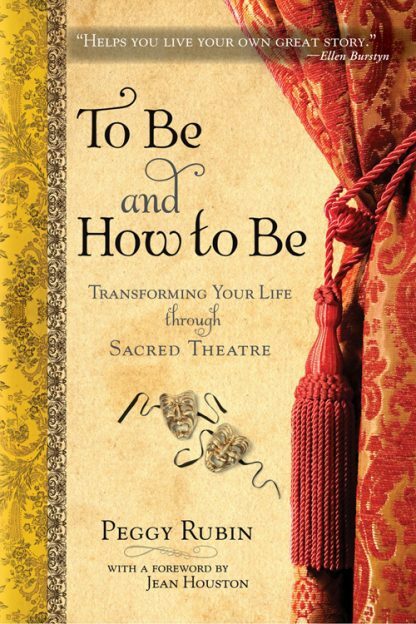 Red Wheel ∕ Weiser Online Bookstore | To Be and How to Be: Transforming Your Life through Sacred Theatre by Peggy Rubin, Foreword by Jean Houston, Ph.D.
Life can be experienced as a great play � sometimes a comedy, sometimes a tragedy, sometimes an epic, sometimes a satire, but always a play. We can think of ourselves as the main character in our own story. Author Peggy Rubin brilliantly uses traditional theatre as a metaphor for living life more authentically and joyfully. To understand our lives as a sacred art form, Rubin traces the roots of theatre to ancient rituals that celebrated the eternal nature of the soul. She provides the tools to tap into the nine powers of sacred theatre so that our lives can resonate with our highest purpose, including The Power of Incarnation, The Power of Story, The Power of Place, The Power of Now, The Power of Expression, The Power of Point of View, The Power of Conflict, The Power of Audience, and The Power of Celebration. "Playing the play of life is a daring adventure," says Rubin. "It takes courage, focus, excitement, and intention to stop just letting our stories happen and instead enact them with verve and delight." Here she invites readers to take the stage of life and play their story for all it is worth. Peggy (Margaret) Rubin is Founding Director of the Center for Sacred Theatre in Ashland, Oregon. Primary activities of the Center include the creation of workshops in Living Life as Sacred Theatre, most often within the context of studies of the Divine Feminine. Peggy has led Sacred Theatre workshops in many locations in the United States, as well as Australia, New Zealand and The Netherlands. Peggy is also the principal teaching associate of Jean Houston, Ph.D., in Dr. Houston's worldwide multicultural transformational work and in her schools of spiritual studies. For the past eight years, she has also been a member of the core faculty of the School for Social Artistry, an intensive leadership training program. Working with Jean Houston, Peggy Rubin has presented classes, workshops and trainings throughout the United States, and in Australia, New Zealand, England, Ireland, Sweden, Greece, Egypt, The Netherlands, India, West Africa, Indonesia, Hong Kong, Taiwan, Jamaica, and on behalf of the United Nations Development Programme, in Albania, St. Lucia, Barbados, The Philippines, Kenya, and most recently the Republic of Maldives. Before joining Dr. Houston's staff in 1987, Peggy was for 14 years the Public Information and Education Director for the Oregon Shakespeare Festival, one of the largest classical repertory companies in the United States. Before that she was a bank executive for First Western Bank in Los Angeles. She has also been a teacher of English, a freelance writer and editor, an actor and director. She holds a degree in Fine Arts from the University of Texas, and has taken courses, primarily in Economics, at the University of California at Los Angeles, and in Environmental Studies at Southern Oregon University.